Gaston Alive! is talking today with Dr. Rachael Wruble of Summit Eye Associates. Dr. Wruble (along with all the lady eye doctors of Summit Eye) has relocated to Gaston County. Not only has she moved here from Michigan with her husband, but several members of her family are soon to call Gaston County “home”. GA! : Dr. Wruble, tell us a little about yourself, where are you from, school, etc. State University in 2001 but completed my Bachelor of Science in Chemistry. An additional four years later, I completed my Doctorate in Optometry from the Michigan College of Optometry followed by a residency, right here in North Carolina, at the W.G. Hefner VA Hospital in Salisbury. GA: What brought you here from Michigan? Dr. Wruble: During my time on the Ferris State golf team, I traveled to many areas in the United States. A life-changing experience occurred while playing in a golf tournament at Tega Cay. On that March day, the weather was beautiful, while back in Michigan there was still snow on the ground. I fell in love with the area and knew I would move here someday. GA! : What is your role at Summit Eye Associates? Dr. Wruble: My primary role is to provide comprehensive primary eye care for all types of patients, from infants to senior citizens and everyone in between. This includes eye exams for a patient that is nearsighted to more serious conditions like glaucoma and multiple sclerosis. In 2013 I took on a new role as a partner of Dr. Ann Hoscheit and Dr. Sandi Farnham. GA! : What would your patients be surprised to know about you? Dr. Wruble: I am a celebrity! Just kidding, but I am “Dancing for Future Stars” to raise money for the Boys & Girls Clubs of Greater Gaston. I have two left feet so wish me luck on this wonderful adventure! GA! : What are your areas of interest or specialty? Dr. Wruble: I love challenging contact lens patients. I often hear, “I can’t wear contacts.” My personal experience as a contact lens wearer for 20 years (non- compliant for many of those early years) and my family history of Keratoconus (disease of the cornea) has motivated my passion for getting the perfect contact lens for my patients. GA! 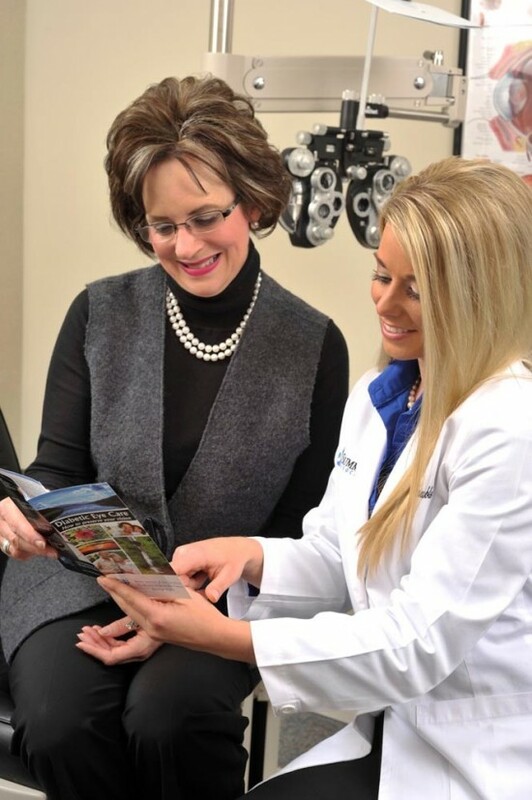 : What makes Summit Eye Associates different? Dr. Wruble: We often hear “you are the first doctor whohas listened to me.” At Summit we have yet to see a pair of eyeballs walk into the office without being escorted by the owner. We take care of the entire person. GA! : We heard about “The Big GiveBack”, what can you tell us about that? Dr. Wruble: In honor of the practice’s 10 year anniversary,we dedicated $10,000 for area non-profits. The winners were selected through Facebook interaction. In addition, we celebrated for 10 days by extending ‘random acts of kindness’ to our patients or the community. An important part of our giving is that we don’t just write a check – we want to engage through volunteer efforts. GA! : What hobbies, sports, causes, interest you? Dr. Wruble: I love hot yoga and any outdoor activities. I am a Michigan sports fan including the Michigan Wolverines, Detroit Tigers, and Detroit Lions. Since coming down to North Carolina I have become a fan of the local sports teams. I enjoy volunteering through Gastonia Rotary East, Leadership Gaston, Gaston Chamber Gaston Jaycees (just to name a few), and am committed to organizations that will improve the quality of life for Gaston County. GA! : What part of your practice has been the most meaningful, or you have enjoyed the most? Dr. Wruble: The best part is seeing a child smile the first time they put on glasses and see clearly or hear that the child is doing better in school because I fixed their vision problem.